We’ve had a lot of Stars Wars in recent years. This is mostly due to a renewed interest in the franchise as a result of several years of new movies. Very rarely do we get content from the viewpoint of the Imperials. Usually, people don’t want to see the story from the bad guys’ point of view. That is unless you’ve seen every view from the good guys and you’re in for a new look. Renewed interest in stories from Admiral Thrawn and Darth Vader show this to be true. Vader has had two runs over the last few years and still has active books. 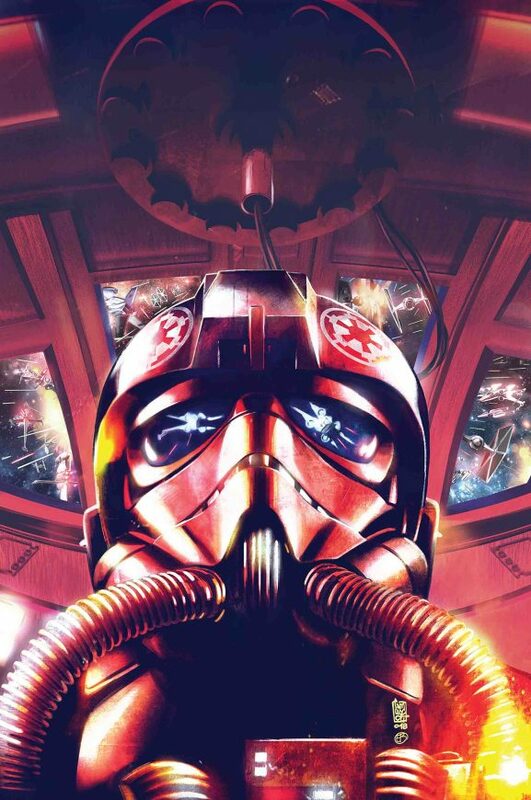 Star Wars Tie Fighter is a snapshot from the lives of the Shadow Squadron. The group chases down rebel insurgents and takes them out. StarWars.com states it succinctly: “From a certain point of view, the rebels are traitors to the Empire, putting the innocent people of the galaxy at risk. In the last days of the Galactic Civil War, an elite squadron of TIE fighter pilots, known as Shadow Wing, is assembled to protect Imperial interests.” The concept is a fresh viewpoint in a thoroughly worked-over story. The story itself is done to the normal high level that Houser has done previously. She recently penned the Rogue One Adaptation as well as Thrawn. She’s already got a pedigree in adapting popular franchises from a ton of genres. There are a couple of indications that this might of been rushed a bit to get out before the Alphabet Squadron book comes out. A little bit of clunky dialog and a spelling mistake felt really out of place here. Another longtime annoyance for me: dark red ink on a black background. Check out the credits page to see what I mean. Might be the hardest to read color combination in all comics. The excerpt from Alphabet Squadron seems to be a little bit of marketing filler here. It’s one thing to have an ad for the “paperback crossover of the year” but it’s another to tack on three pages for the sake of pushing a paperback. Minor grievances aside: this is a good book. It’s a fresh glimpse into the Star Wars universe that should keep fans happy until they have another Major Motion Picture (tm) to complain about.